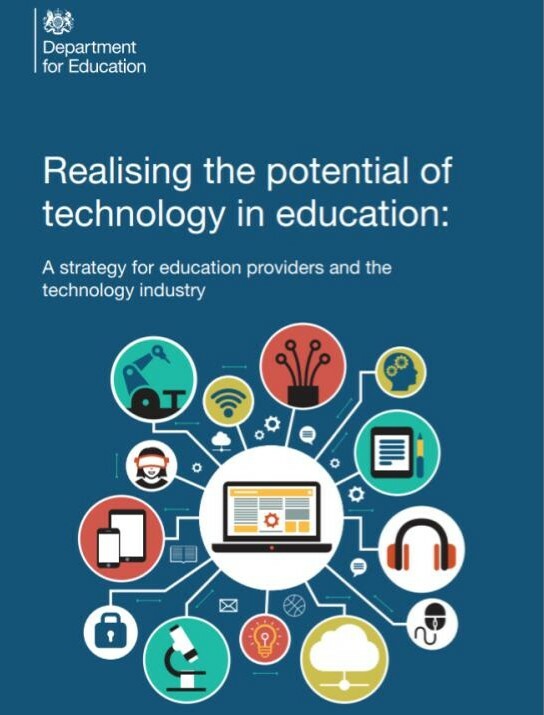 The DfE today publishes a new strategy for EdTech, 'Realising the potential of technology in education: A strategy for education providers and the technology industry '. The strategy sets out the Government's aim "to support and enable the education sector in England to help develop and embed technology in a way that cuts workload, fosters efficiencies, removes barriers to education and ultimately drives improvements in educational outcomes". The document identifies some key barriers to capitalizing on these strategic opportunities - digital infrastructure, digital capability and skills, digital procurement capabilities, and concerns over privacy, safety and data security - and gives a number of concrete commitments in each area. A key condition for realizing the potential of technology across the education sector is seen to be the "development of a vibrant EdTech business sector in the UK to provide proven, high-quality products that meet the needs of educators and foster a pipeline of fresh ideas"; strategies to catalyse innovation, stimulate demand, facilitate marketplace interactions, and encourage a partnership approach between educators and businesses are enumerated in detail. Alongside a focus on efficiencies and business, the strategy also contains welcome recognition of the potential of technology to improve access, inclusion, and educational outcomes across all phases of education, including life-long learning, and identifies barriers that need to be addressed in these areas, such as CPD for educators and leaders. A series of ten specific 'EdTech Challenges' is launched with the intention of stimulating innovation and improving the evidence-base across the areas of strategic opportunity identified, while a new EdTech Leadership group made up of representatives from across the education sector and industry will be established to help drive the agenda forward. The Association for Learning Technology is pleased to have been able to provide input to this strategy on behalf of our membership. A coherent EdTech vision from Government, together with some concrete commitments, is to be welcomed, and ALT looks forward to participating in the delivery of the strategy. As a scholarly and professional community which embodies 25-plus years of research and practice in Learning Technology, and which represents members and works actively across sectors, we are well placed to draw together expertise from and facilitate dialogue and collaboration between practitioners, researchers, industry, and policy-makers, in order to help ensure that the strategy is delivered effectively and with the right emphases.